Nitrates, nitrites and eating sausages. There has been so much talk about red meat over the last few years. The guidelines from the WHO told us not to eat too much red meat and showed the link between red meat and colorectal cancer. This risk was higher with processed red meat. Today it’s been more news about processed meat causing cancer, so as a population we are still eating our bacon it seems. The problem this time is nitrates (NO3) and nitrites (NO2). 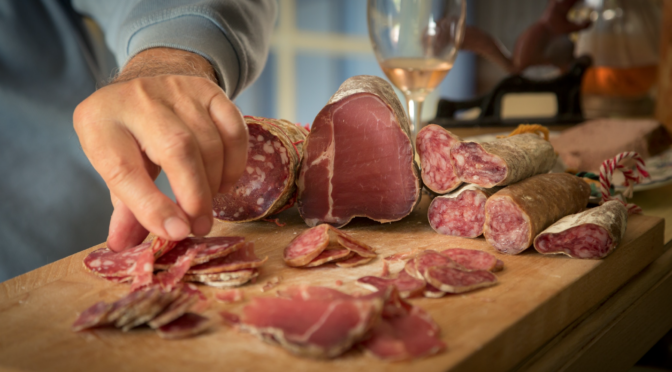 These are often added to processed meats as they help it keep its pink colour and are important in food safety – protecting against botulism. Nitrates are metabolised to nitrites in the body, these are all fine until they combine with protein to form Nitrosamines. These can be carcinogenic. There lies the problem. However nitrates themselves can be beneficial, they can relax blood vessels, being beneficial for blood pressure. They can improve the blood flow to muscles in exercise and they are a cofactor for reactions in the body. 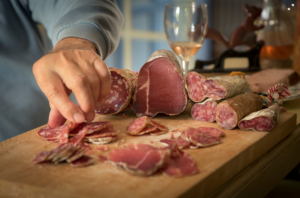 Nitrates are found in processed meats such as bacon, ham, salami and chorizo. Interestingly they don’t seem to be added into UK made sausages, which is a slight win. They are also found added into higher amounts in smoked fish, cured fish and beer (especially German beer). The levels in your piece of ham are small. Nitrates are also found in vegetables however these naturally occuring forms do not appear to react in the body in the same way as those added into meats. The take home – eating less meat is a good thing for the planet and for our bodies, but there is no need to cut it out entirely. In my opinion cutting things out is generally not a helpful approach. Processed meat is not something to be eating daily but it is ok to eat it occasionally. You can find some processed meats now that are nitrate free, check the labels nitrate/nitrites, but remember that does not mean you can eat it regularly. As a population we all should be eating less meat and more plant based proteins when we can. So keep that bacon sandwich for a now and again brekkie. Green tea is made by the rapid steaming of freshly harvested leaves which stops the process of oxidation to black tea. Green and black tea contain similar levels of total flavonoids but the difference in oxidation means there are differing types of flavanoids. Black tea has higher levels of theaflavins and thearubigins and green tea has 3.5 x the catechins levels. The main catechin in green tea is Epigallocatchin-3-gallate (EPCG). 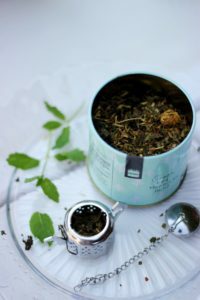 Brewing time, the method to make your tea and the tea quality are all things that influence antioxidant status. Tea polyphenols are effective antioxidants and scavengers of free radicals. Studies show an increases in antioxidant levels in humans after drinking green tea. This is what is likely to provide any health benefits. There is a misconception that green tea is caffeine free like a herbal tea. It is lower in caffeine but still contains some. Up to 400mg of caffeine a day is considered safe. That’s 8 cups of green tea! It may not be as hydrating as water but it does still provide hydration. Most studies on tea are observational, are conducted on animals or in Asia where there is a different diet. Therefore it is an area we need clearer studies and research results. 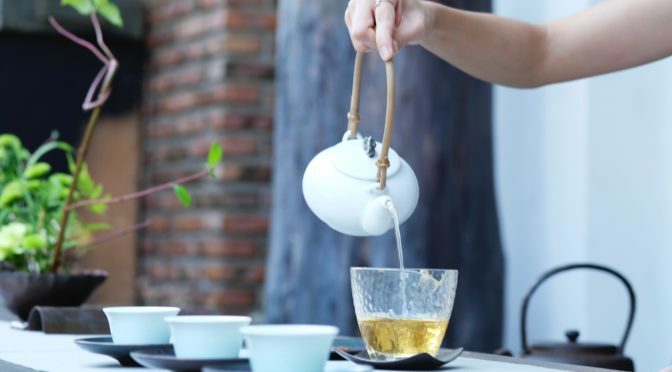 Flavanoids in green tea has been shown to lower LDL cholesterol levels and decrease blood clotting. A meta-analysis of 13 research trials showed a decrease in systolic and diastolic blood pressure, total and LDL cholesterol, blood Triglyceride (fat) levels and overall stroke risks. So it does sound like there are benefits for your heart. This is a an area that had a lot of interest. There is some mixed evidence here suggested green tea may stimulate thermogenesis and increase fat oxidation. This means you burn more calories when you digest your food and you use up more fat stores. Sounds good but the results were modest and so this won’t give you large weight loss. It’s certainly no magic cure but switching from a soft drink to green tea daily will reduce your calorie intake. There are very mixed results in the research so over there is no clear proof either way. Green tea is certainly packed with antioxidants so it could help and it won’t hinder. 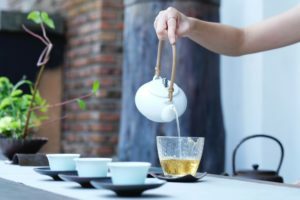 Animal studies and studies on post menopausal women shows an association between tea consumption and better bone health due to the tea polyphenols. We have some emerging evidence for green tea improving muscle strength and bone health. An exciting area to focus on. There is some research showing a link between green tea and brain health with it improving memory and brain power. Could be worth a green tea cuppa in the mornings. Over all we need more studies to give us further information but it does seem that green tea is a good choice for your cuppa. 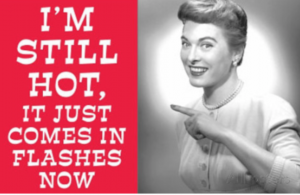 The menopause is a time of life that can be distressing and cause symptoms that affect the quality of life significantly. However it is also a time of life that we neglect to talk about which makes it harder for women to know the evidence for treatments and where to get support. 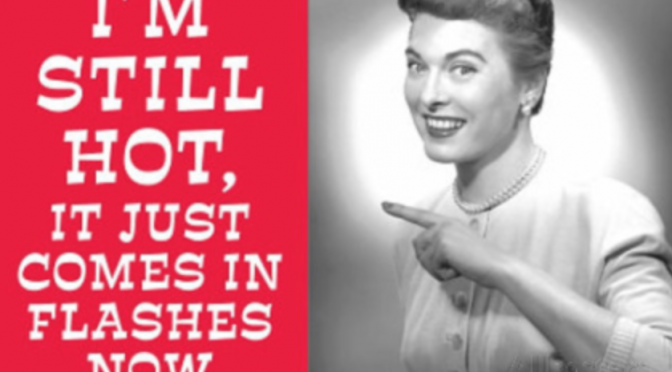 When does the menopause occur? The average age is 51yrs, but there is a wide range. The menopause is defined as 12 months after your last menstrual period. Women can be in the peri-menopausal stage where hormone levels are changing and symptoms are occuring for 4-5 years before the menopause occurs. Symptoms can include hot flushes, night sweats, mood swings, disrupted sleep, brain fog, poor concentration, vaginal dryness and joint pains. For some these are mild and for others these are severe causing day to day life to be altered and upsetting. There are many supplements, pills and potions around that are said to help with the symptoms of the menopause. Sadly a lot of these have no real evidence behind them and end up being very expensive. Nutrition is something that plays a pivotal role in our health so it will come as no suprise that there are dietary changes that can be made to help offer some relief. There are also health issues that need ot be considered with the menopause approaching, which are covered below. These are one of the most common symptoms and one reason why HRT is recommended. Other lifestyle changes that can help incllude reducing the intake of alcohol, spicy food and caffeine. Weight loss can also help, a study has shown an improvement of 30% with 5kg weight loss. Countries that eat more soya foods seem to have a lower incidence of hot flushes. This is thought to be due to the phytoestogens. Research suggests 2 x 200ml glasses of soya milk a day of 80g soya mince will give you this benefit. Bone loss is escalated in the menopause, so calcium is slowly lost from the bones. this is due to osteoclast cells that breakdown bone work harder than osteoblasts (cells that build bone). The recommended daily amount of calcium in the UK is 700mg/d if there is no risk of osteoporosis. However many women reach the menopause with low bone mineral density, in which case they will need to be having more like 1000-1200mg/d. Therefore it is important to focus on increasing calcium rich foods. Good examples include dairy, fortified plant milks, sesame seeds, dried figs, watercress and fortified bread. Weight bearing exercise will also help with bone health. A note of caution is that excess vitamin A is associated with an increased risk of osteoporosis, so post-menopausal women should not exceed 600 micrograms a day. Levels of total cholesterol can rise after the menopause whilst levels of HDL cholesterol tend to fall. This can, combined with weight gain and falling oestrogen (oestrogen is cardio-protective) can be a risk for heart health. Metabolic rate slows down by about 10% after the menopause, this is why central weight gain can occur. Therefore staying active and eating a balanced diet is key. Resistance training using your body weight or light weights is a good alternative to high impact workouts. Reduce saturated fats and eat more polyunsaturated and monounsaturated fats, for example more nuts, avocado, olive oil and seeds. Soluble fibre is good for heart health and cholesterol levels. Godo foods include oats, barley, nuts, seeds, beans, lentils, peas. Incorporate more soy based foods into your diet. Soya milk, yoghurt, soy mince and tofu. Ensure you are eating calcium containing foods – dairy, plant based fortified milks, green leafy veggies, tofu and tinned fish with bones. Also take a vitamin D supplement. Keep active and include weight bearing exercise in your week. 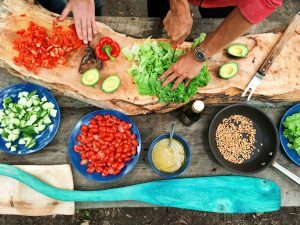 Environmentally Sustainable Diets – how to eat to save the planet. This is going to be a hot topic. As a nation we have never had such access to food. Yet our diets are at their worst and the way we eat is unsustainable. Our food system is responsible for 15-30% of Greenhouse gas emissions (GGE’s) in the UK. This is due to all stages of food production from farm to fork. 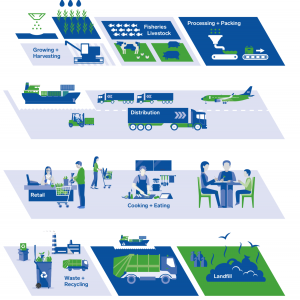 From using farm machinery, processing and packing food, the transportation and storage of it to how we cook it, then the waste and recycling afterwards. Foods that contribute the most to Greenhouse gas emissions are red meat, dairy and soft drinks, so consuming less of these will make a definite impact. The production of food accounts for 70% of human water use, which is a huge amount. 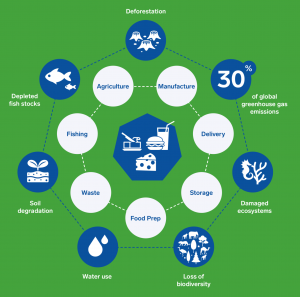 It is damaging our planet – through deforestation, pollution, a loss of biodiversity and damage to ecosystems. In the UK we could make a huge difference to our planet just by focusing on not wasting as much food. An extra-ordinary 10 million tonnes of all food produced is spoiled or wasted in the UK every year. Whilst you may think restaurants and large scale catering is responsibly for this, actually the majority (71%) occurs in the home. So what can we do to help? 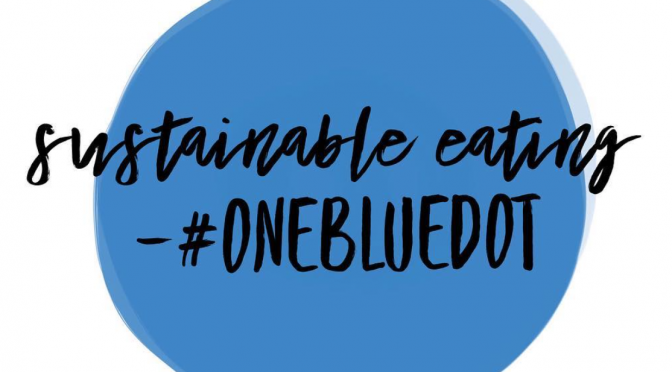 This week one blue dot – a toolkit on environmentally sustainable diets has been released by British Dietetic Association with guidance and research on how we can eat sustainably. Below I summarise the main points. This imformation is undoubtedly going to raise the questions “So should we all go vegan?” My answer would be – Not unless you feel strongly about it or really want to. It’s about making swaps to some meals, eating less of some foods and having more plants in our diet. However also thinking about how and where we shop, what we do with food waste and packaging too. Reducing red meat intake to 70g or less a day. A lo Or commit to eating meat less times in your week. 50% of the UK population eat meat on a daily basis. A reduction in current UK consumption of total meat (108g per day)1 for adults to 50-99g would reduce our carbon foot print by around 22% whilst a further reduction to below 50g per day would result in a 39% reduction. Switch to eating more beans, lentils and pulses, soya, tofu, mycoprotein, nuts and seeds. These are plant based swaps for meat. So a lentil bolognaise or using adding beans into a curry so that less meat is needed. Eat moderate amounts of dairy and include plantbased swaps. There is now a huge range of dairy alternatives, it is important to check these have added calcium in them. Choose fish from sustainable sources. Over fishing and poor fishing practices have impacted on fishing stocks and the marine ecosystem has been damaged. Eat more wholegrains including tubers and potatoes. Go for seasonal fruit and veg or choose frozen and tinned options. Tap water over soft drinks, tea and coffee. Soft drinks are a large contributor to our carbon footprint due to their processing and packaging. 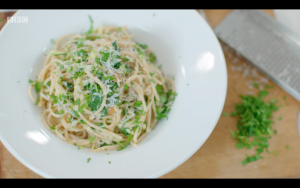 Reduce your food waste. This is a huge area for us to all focus on. Shopping for only what you need, using all the leftovers and being savvy with portion sizes can all help. After making these I was named the Empress of Veggies by the one and only Gregg Wallace, so I felt I had to share this recipe! 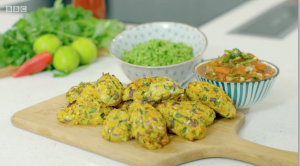 It is a little messy to make (make sure you squeeze the fluid out of the veggies) but those dips combined with the croquettes = heaven. Place all the ingredients for the sweetcorn salsa into bowl and mix well then tip into a serving bowl. 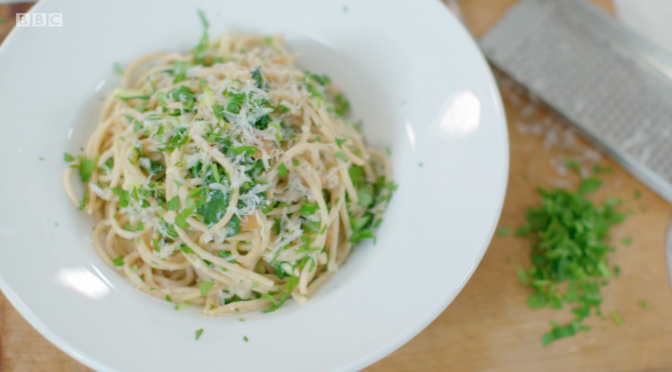 I hope you enjoy making these and it gets you eating more veggies! This is a topic I’ve been wanting to write about for ages and a media quote has spurred me on. I think we all know someone suffering from depression and the incidence seems to be on the rise. Depression is a multi-factorial disorder, something that was highlighted to me in a conversation to a journalist this week. I don’t believe that just changing one thing will be the cure. You can have the perfect diet but could still suffer, so instead it’s seeing diet as part of the picture and combining this with medication, therapy, sleep patterns, exercise and all round lifestyle. 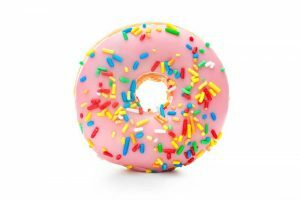 Looking through some of the recent evidence on diet and depression an instant pattern emerges. Eating a balanced diet that relies less on processed convenience foods and more on eating from scratch is the answer. More fruit and veggies, wholegrains, olive oil, fish, low fat dairy is associated with a decreased risk of depression. 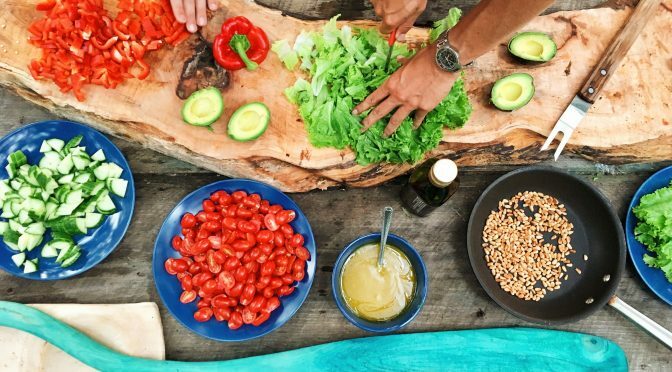 An antidepressant food score was worked out by researchers, looking at the nutrient density of foods that have clinical evidence for helping in depression. The top foods were oyster, seafood, organ meats, leafy greens, lettuce, peppers and cruciferous vegetables. Now it’s usually more helpful to think about nutrients in terms of foods, so here are some top ways you can boost your antidepressant nutrient intake. 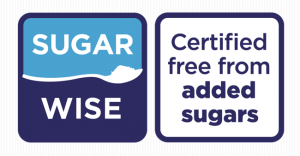 Eat regular meals – the brain needs glucose as fuel and eating regularly helps prevent blood sugars dropping too low which can give symptoms of fatigue, tiredness, lethargy. Include healthy fats in the diet to nourish the brain. Oily fish, nuts, seeds, olive oil are all good ones. Aim for 2 portions of oily fish a week. Wholegrain foods are good sources of zinc, and B vitamins. Think wholegrain bread products, brown rice, brown pasta, grains. Ensure you eat protein regularly for tryptophan, iron and zinc. Tryptophan is thought to play a key role as it is a precursor for the neurotransmitter serotonin. Wholegrains, fish, poultry, eggs and seeds can help with this. Green leafy veggies contain folate, iron, potassium and magnesium plus vitamin C. Another reason to get crunching your veggies. Orange veggies such as sweet potatoes, orange peppers, carrots and apricots plus green leafy veggies are sources of vitamin A. Even slight dehydration can affect your mood. The brain is 78% water. Reducing caffeine and replacing with non caffeinated drinks, mainly water will help. Moderate intake of alcohol can be ok but watch the interactions with medications and too much alcohol can increase anxiety/depression. Following a Mediterranean style of eating with a focus on fruit, vegetables, wholegrains, protein, oily fish and healthy fats is a great way to help combat depression. It may not be the cure but it is definitely a large part of the puzzle. There is no perfect way to eat. The more I learn about nutrition the more I am convinced of this. The science of nutrition is continually evolving, growing and being researched. 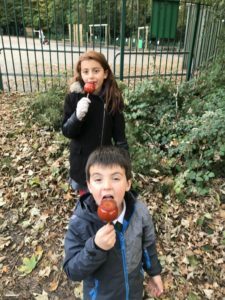 We are learning all the time and it’s a lot more complex than it looks on the surface, but also there are simple steps we can take to eat well. Things are not always in your control. Our tastebuds, culture, finances and social circumstances are just somethings that can affect how we eat. 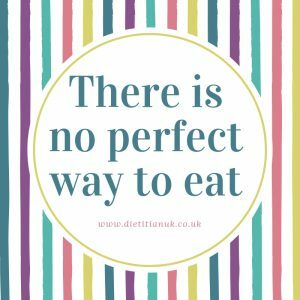 The good news is there is no perfect way to eat. There are many, many ways to eat a nutritious diet. It’s not about striving to be perfect or have the best meals. It’s about eating as well as you can with what you have. No guilt. No shame. No judgment. Our bodies change and need different things at different stages of life, often our bodies are able to adapt and help with this. As a baby, a mums breastmilk will change depending on what the baby needs. Teenage bodies are able to absorb more calcium than at any other time of life. In pregnancy our bodies adapt and will absorb more of certain nutrients such as iron to provide for the baby and changes in the body. Isn’t the body amazing, it knows what we need better than we do. So one of my top tips is to focus on trusting your body, listening to your body and learning what your internal cues feel like. What does hunger feel like to you when you are very hungry, a little hungry and not hungry at all? What cues does your body give you about the foods it needs? 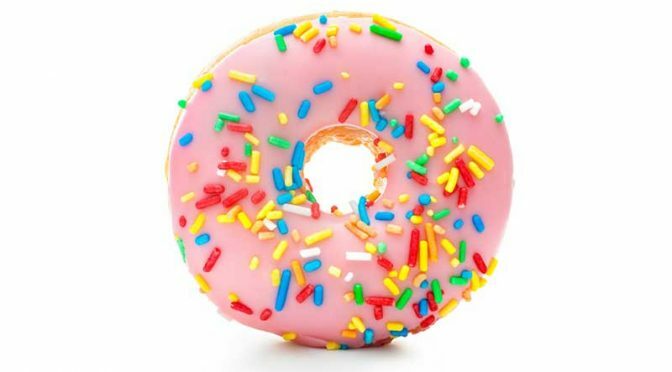 Do you get cravings or suddenly feel you are drawn to certain foods? Sometimes this can be due to the nutrients in these. For example craving vegetables after a trip away when you have eaten differently, or craving salty foods when you haven’t had any salt for some time. My favoured approach in my eating disorder work is to focus on reaching a healthy state and not a healthy weight. On reconnecting with your body and not ignoring it’s signals. This can be very hard to do and a long journey. It’s not all about the numbers on the scales. Sometimes shifting the focus away from weight can make a huge difference. There is no perfect way to eat or perfect way to recover from an eating disorder, but we do have amazing bodies that can help us discover the right way for us. If you need any help with this then do get in touch.